Mother nature has done her fair share of damage to the East Coast of North America this week. Dubbed the largest Atlantic hurricane in diameter on record, Hurricane Sandy has been on a crash course for the East Coast since its Caribbean birth on October 22. In the wake of the current superstorm, where have people been turning to for emergency information? For authorities, news outlets and individuals (many still without power), social media channels seem to be the only choice. For those looking for up-to-the-minute ways to seek and share information about the disasters, it’s clear social media channels are emerging as the best, most accessible tools. Meanwhile, the top status update on Facebook for example, the morning of October 30 was “We are ok,” written by people reassuring their distant friends and relatives. As Hurricane Sandy continues its way across the East Coast, she has left millions in the dark, struggling with rising flood waters and massive power outages. Social media tools are, in some cases, the only assist in connecting people and supplying information. As the massive storm initially approached the mainland, several helpful articles on how to stay connected via social media were already in circulation, reminding people to download Flashlight apps and the Red Cross First Aid app for first aid tips and to monitor Twitter for news updates. HootSuite Tip: In a recent #HootTip, we explain how to create quick search streams in your HootSuite dashboard to monitor the latest social updates. Both #Sandy and #HurricaneSandy have been popular hashtags in the wake of the storm, so start by watching those. Some articles even go as far as saying that following #sandy could save your life. To assist emergency social profiles, Twitter users are encouraged to help distribute safety information, especially to those who aren’t using social media. Another useful social tool is Google’s interactive ‘Google Crisis Response’ map, which provides up-to-the-minute information on Sandy’s path, areas of high wind and flooding, best evacuation routes and links to webcams in the surrounding areas. This has proven to be a useful tool in the past; Hurricane Isaac had its own map also. Have friends or family on the east? Watch the local webcams from google’s crisis map to ensure that they’re safe and sound. Use the “layers” option on the embedded map below to find location-specific information like webcams, emergency shelters and traffic information. Companies all over the East Coast are finding themselves ill-prepared for the emergency and customer outreach. In our recent interview with Alex Schott, Manager of Social Media & Digital Communications Strategy for Fortune 500 Company Entergy, we discussed his top 4 social media crisis management tips for business. Schott’s interview was in response to his quick and effective response to thousands without power during Hurricane Isaac, which is especially useful information now. Likewise, 5 tips for responding to a crisis on social media article caters specifically to best social practices for emergency response teams. 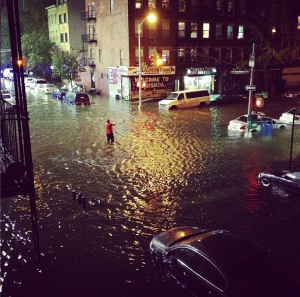 Just as 140-character missives have played an integral part in communicating the severity of Hurricane Sandy, so too has citizen journalism. #Sandy is trending in image captions across Instagram and the photo-sharing site has dedicated a section of its blog to sharing the most telling images from the disaster. While it is essential to be prepared for emergencies, it is crucial to maintain open lines of communication and provide current information during a natural disaster. To prepare for the event of a disaster, one large utility provider to one of the US States conducted a “crisis simulation” exercise with the HootSuite Services Team. During the simulation, the company received a barrage of (realistic, but staged) customer concerns over several social media channels, in a closed test environment. Adding a social media plan to your emergency drills seems a good step for any company with dependencies on current information during a crisis. Test your company’s ability to react using social media during a disaster. If you’d like to know more, contact the HootSuite Enterprise team using this form.